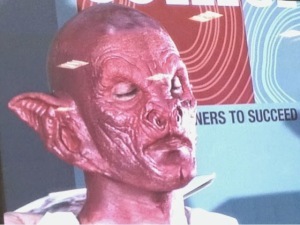 Media Make Up, Speciall Effects Demo by Thomas E. Surprenant. Yesterday my great friend Louise and I travelled over to Calderdale College in Halifax to watch the amazing Thomas E. Surprenant. Thomas is known for his work on Donnie Darko (2001), Star Trek: Deep Space Nine (1993), X-Men: and The Last Stand (2006), he has a huge list of amazing films he has worked on. But I must say I was most impressed with The Grinch Who Stole Christmas, one of my favourite films ever. Thomas also won a Primetime Emmy in 1995 and was nominated in 1996. I did not really know what to expect as we only got the opportunity to go to the event on Friday at 4pm, and to be honest; I was totally engaged in Brit Mums at this time. As a Hairdressing Lecturer it is not really my field, however as lots of our level 3 students go on to university to study theatrical media and make-up, Louise and I decided it would be great to get an insight into prosthetics. Also, I loved all the prosthetic work of the creatures at the Harry Potter Studios, when we visited a couple of weeks ago. This is the field I would have loved to work in when I was younger; unfortunately there were just not the opportunities out there when I left college. Thomas started with a young man will a full head of hair, firstly he used a product to control the hair and make it adhere smoothly to the cap, he then applied the applied a bald cap and melted the edges with acetone to blend them before adhering to the skin. 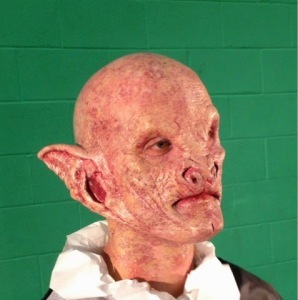 He then applied the prosthetic and ears and blended then, sorry this is not very technical but I have never watched a demo like this in my life, it was fantastic. We then watched Thomas weave his magic and layer colour upon colour to create one of his trademark monsters. I still can’t quite believe we watched his magic unfold before our eyes. It was a very long process, which took lots of patience. Thomas told some amazing stories of the people he worked with and the films he worked on but did this in a very professional and gentlemanly manner, maintaining confidentiality and never once be bitchy. Yet giving the audience enough information to keep them engaged. It isn’t an easy task; engaging an audience for a full day. Especially when watching a slowly paced demo, but he did a fantastic job. We came away wishing we could be that talented, but excited that some of students had those prospects in front of them. 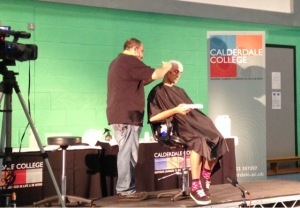 Thank you, Thomas and Calderdale College, for a totally inspiring day. 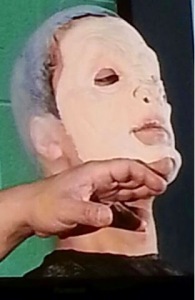 As you can see the result was really scary, and sooo realistic. This is exactly the look you would expect to see on a horror, or science fiction movie.